Oops, I did it again. I made a THIRD Togue Pond Tank!!! I told you before, I was first introduced to this pattern via Fringe Association a year ago, put it in my queue and thought to myself I am just learning sweater construction so I will wait until I’m more confident to try this one. 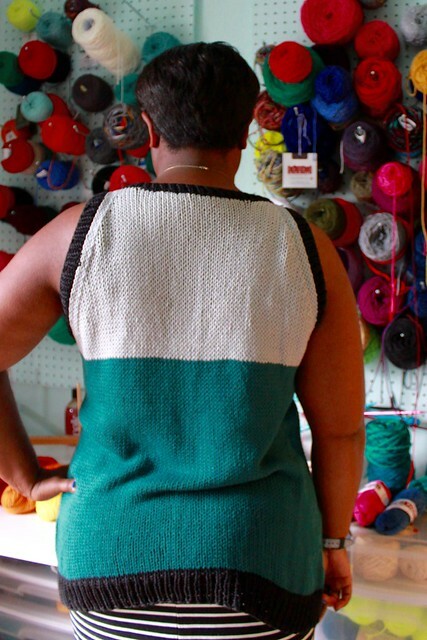 Then after loving the feel of Berroco Modern Cotton I wanted to make myself more summer knits, so I knit my first Togue Pond Tank at the end of June. I loved it and thought the construction was pretty straight forward but I wanted it to be about 2 inches longer in the front (this was my first bottom up knit). Then my BFF Jess kept dropping hints that she wanted one, so I whipped one up for her next. So I still had enough yarn leftover and wanted to make myself another Togue Pond Tank that was long enough in the front that I didn’t need a tank top to wear underneath. And here she is, in all her glory! I took these in a quick rush as I was heading to work, so excuse me for not smoothing out the back. I decided to do 3 colors for this one (I’m so wild). I love knits that are edged in black, it makes the colors really pop so I got a skein of Modern Cotton in black to compliment the light grey and dark teal/green I had leftover in my stash. I cannot stress to you enough how much I absolutely love Berroco Modern Cotton. It feels great and the drape on my knits with this is perfect. 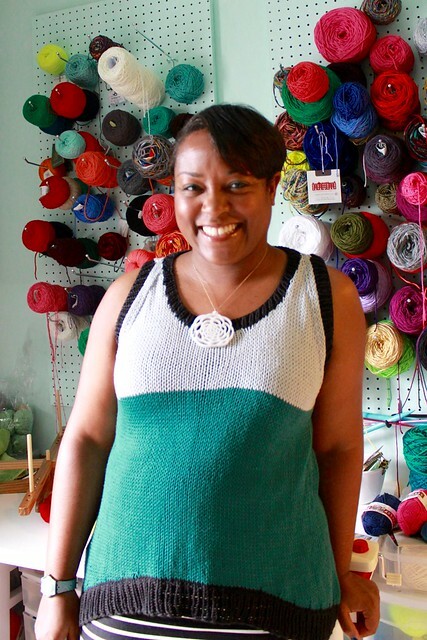 I am so happy my local yarn store, Fibre Space, started carrying it this spring. I also decided to try using the Double Knot Method for joining a second ball of yarn. I hate sewing in ends and I am not the best at cleanly sewing in yarn. It held up and the joins were also pretty seamless. This is what I love about knitting, with each project I learn something new. I promise, this is my last Togue Pond Tank this year but I can’t promise you I won’t make more next summer. I’m so glad I added this pattern to my stash! Up next, finishing off the Estelle Cardigan for my aunt and working with another cotton yarn to create a transitional sweater for fall. 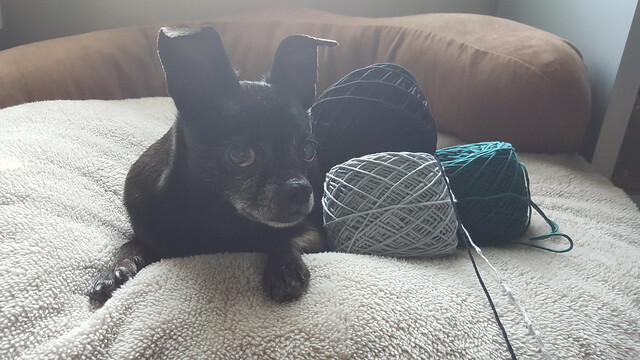 What’s on your needles right now? It turned out very well! 🙂 It definitely turned out to be a great piece!!! Go ‘head with your bad self Dana! I love the color blocking you did on it. Really love the way the black edges sets the other two colors off.